From icy Greenland to Tierra del Fuego, the Western Hemisphere includes more than two dozen countries and territories, is home to close to one billion people, and is a wealth of countless cultures, languages, and people groups. 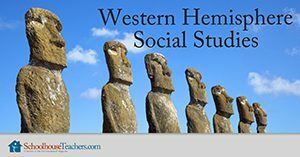 This Western Hemisphere Social Studies homeschool course is a basic introduction to the geography and peoples of North and South America. 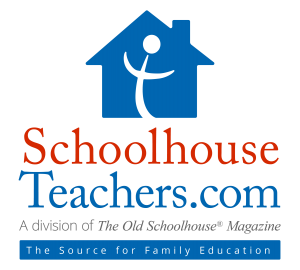 Go to Class Lessons and download the lesson plan and lessons file. Start with the Day 1 reading assignment. Follow the instructions each day on the lesson plan and check them off when completed. Eighteen Western Hemisphere Social Studies homeschool lessons explore the geography and cultures of countries in North and South America. Canada is part of North America. Exactly how big is Canada? What types of landforms are in Canada? Geographically speaking, what makes Canada special? Let’s go on a journey to Canada to learn more! North America is the third largest continent in the world, and it has twenty-three countries within it. The northern region of the continent contains Canada. At a latitude of 50°26’ and a longitude of 104°37’, Regina is the Canadian city closest to the geographical center of North America. What makes up Canada? Mountains, plains, plateaus, lakes, rivers, reservoirs, the coast, and tundra are part of this country! Some of the mountain ranges from the United States even continue into Canada. 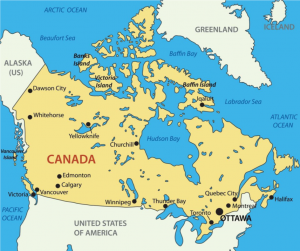 The total area of Canada is 3,855,103 square miles. Most of the land area is divided into territories and provinces. These areas are defined by political units. Canada has three territories: Nunavut, the Yukon, and Northwest Territories. Each of these territories has their own government and legislature. 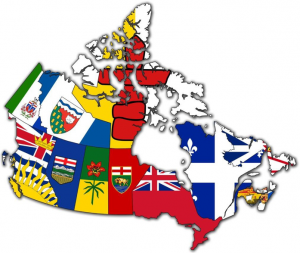 Canada is also divided into ten provinces: Ontario, British Columbia, Alberta, Saskatchewan, Manitoba, Quebec, Newfoundland and Labrador, New Brunswick, Nova Scotia, and Prince Edward Island. Mountain ranges are defined as a line of mountains connected by high ground. The Canadian Rockies stretch 3,000 miles to New Mexico in the United States. One of Canada’s most visited destinations is Banff National Park and Lake Louise. The northern third of the Appalachian Mountains are in Canada. These include the Chic-Choc Mountains and Notre Dame Mountains between Quebec and New Brunswick. The Pelly Mountains are located in British Columbia and the Yukon Territory. Lastly, the Torngat Mountains are located in northern Quebec and on the Labrador Peninsula. The Canadian Shield is a large region in Canada shaped like a saucer. It is higher on the edges and lower in the middle near Hudson Bay. The geographical area is nearly 3.1 million square miles. It reaches as far north as the Arctic Ocean. Due to the size, a variety of landforms exist in the Canadian Shield, with a wide variety of climates as well. Several bodies of water are within and along the borders of the country. The Pacific Ocean borders the west coast, and the Arctic Ocean borders the northern area. Several seas also surround the country: the Beaufort Sea, the Gulf of Alaska, the Bering Sea, the Hudson Bay, and the Labrador Sea. Canada contains more lakes and inland waters than any other country in the world. In addition to the Great Lakes on the US border, the country has thirty-one lakes measuring more than 500 square miles. All of this water means a great deal of coastal area. Canada has 151,000 miles of coastline! If you walked 12.5 miles each day, it would take you thirty-three years to walk along all of the coast! As you can see from a map of the country, there are many islands. There are 52,455 islands within the country of Canada! Print the map at http://printablemaps.net/north-america-maps/canada-maps/maps/CANADAprovince-outlines.pdf and label the Canadian Shield, provinces, capitals, mountain ranges, plains, and plateaus. Make an edible map of Canada. Be creative! You can make the base from sugar cookie dough, peanut butter dough, or simply piece together tortillas! Think of foods or candies you can use to represent the various landforms. Include the borders of the provinces and territories. Use special items for the capitals. Make a bar graph depicting the population of each of the provinces of Canada. This one-semester Western Hemisphere Social Studies homeschool course is designed to give upper elementary-middle school homeschool students a basic introduction to the diverse cultures and wide array of geological regions that are all part of the Western Hemisphere. Major nations of North and South America are covered, as well as many islands and territories. 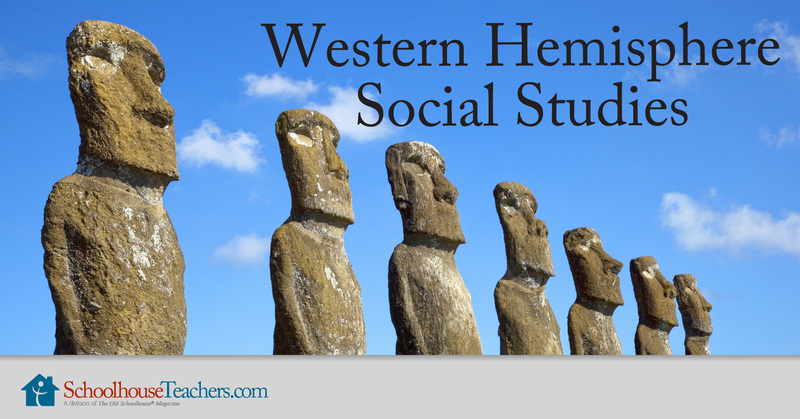 Would you like to tell others about this Western Hemisphere Social Studies homeschool course?